Flat cast production to both faces from high quality mould faces produces outstanding quality of finish suitable for direct decoration of faces with minimal pre-decoration treatment being necessary. Insitu fill of the cavity provides enhanced continuity giving the benefits of insitu with the finish quality of precast. 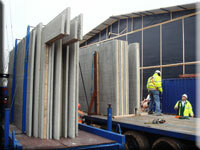 Optional insulation application to insulate outside faces without the requirement for post fixing on site. Concrete continuity at joint interfaces between wall and floor providing greater security in meeting the requirements of sound reduction in the Building Regulations at component interfaces. A system of sway frame design allowing removal of shear walls in the longitudinal direction and allowing non structural elevation cladding, glass infill or clear openings between walls. 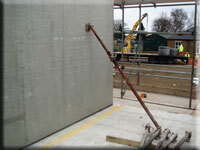 Optional hollowcore or composite slabs with cast in fittings for passive fall protection. 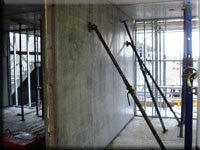 Optional limited services incorporated within wall panel to permit direct finishing of the wall face without rebates. Precast Structures manufactures concrete in both UK and Germany, thereby offering a very large production capacity.